The NEC is a 800-seat entertainment center (retractable tiered seating) that can be used as a 600-cover dining hall. 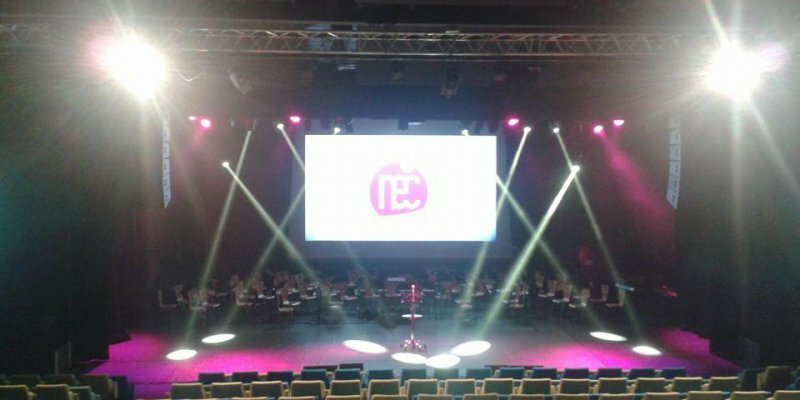 It is equipped with tables and chairs and has two motorised pipe grids, one above the stage and the other opposite in the auditorium. The facilities also include a hall (approximately 200 sq. metres) with a bar equipped with refrigerators, two furnished dressing rooms and a well-equipped kitchen with cold room and cloakroom. The public car park is located at the back of NEC, on the Jules Ferry car park, 5 min walk, technical car park directly behind the building. PMR access on reserved places right in front of the main entrance. The building only has one level, and the room includes 10 PMR reserved slots. Catering services in the city center, accommodation to be provided on Metz, possibility of enjoying the sound system or the lightings of the room (data sheet upon request) by personal and material equipment, or the Fire Safety Service (rates for these services upon request) .